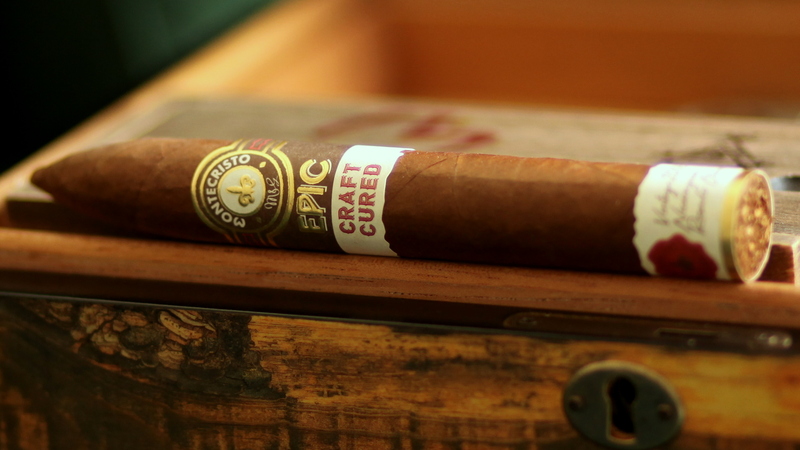 Up for review today is the Montecristo Epic Craft Cured, which is the latest release from Altadis (shipped to retailers in December of 2017). I had been waiting eagerly in early January for the cigars to arrive at Nat Sherman, and after I complained one too many times about the cigars not having arrived on Facebook, Rafael Nodal was kind enough to send me a few for this review. The Montecristo Craft Cured was blended by the Plasencia family, the same minds behind the Montecristo Espada (a cigar that remains my favorite from Montecristo). The line is offered in three sizes, robusto, toro, and belicoso. Up for review today is the Montecristo Epic Craft Cured Belicoso. 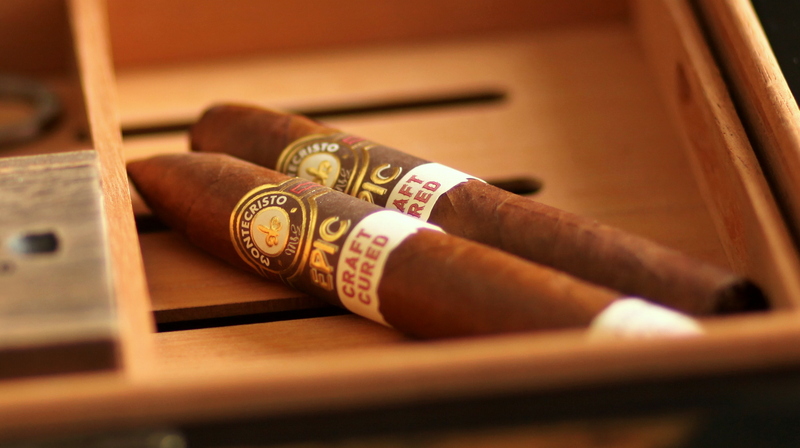 The Montecristo Epic Craft Cured is a beautiful cigar, sporting the Montecristo Epic labeling with an additional band on the foot naming the Vintage 2006 Nicaraguan Rosado Oscuro as the wrapper leaf. It’s a nice touch. The wrapper itself has a few moderately sized veins, with a slightly rough texture and light layer of oil. The cigar has great weight in the hand and a touch of give when squeezed that is consistent over the length of the cigar. Testing the draw, I find that the restrictiveness on the draw is substantial, bordering on too tight for comfort. The pre light draw reveals notes of caramel, nuts, wood, and a touch of spice which lingers on the lips. On lighting, the cigar kicks off with medium bodied smoke. Dominant flavors include leather, cedar, coffee, and oats. The texture is creamy, which complements the dryness of a competing dry cedar. There’s also a touch of sweetness. The cigar releases above average amounts of smoke, making the above average restrictiveness of the draw less of an issue. An inch in, a bitter chocolate note enters the smoke, along with a white pepper which is evident both on the draw and (much stronger) on the retrohale. At this point, the bitter side of the profile (dark chocolate, leather, cedar) is dominant, with a sweet oatmeal not quite balancing out the experience. This is making me wonder if a coffee with milk or cream would help balance out the bitter side nicely. The ash is solid, with no fraying or splitting, and rolls off in one piece. Moving into the second third, Montecristo Craft Cured finds more balance, with the oats and sweetness gaining a bit more share of the profile. The dry cedar also moves back to the retrohale joining the white pepper, providing more space for an emerging hickory note in the aroma. By the final third, the pepper and dry cedar are on the retrohale, and a floral note has developed alongside the hickory, cream, and oats. The body and strength are at medium to full, and the smoke has become smoother than at any point previous. Unfortunately, that only lasts till about the last inch and a half, where the smoke becomes bitter and harsh, leading me to set the cigar down. 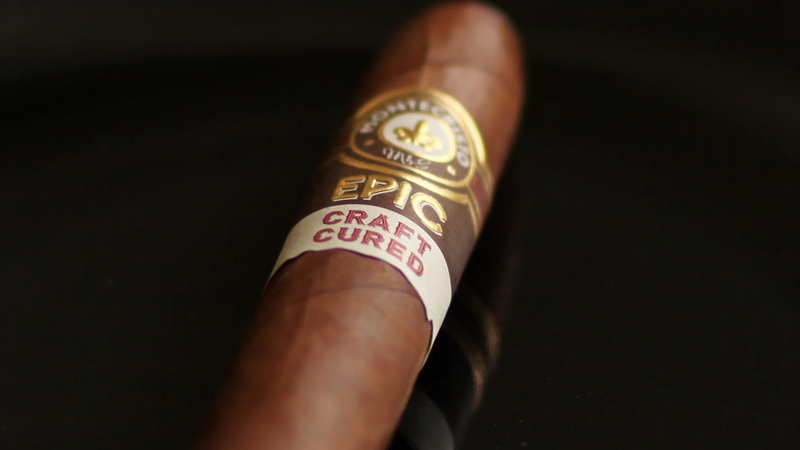 I enjoyed the the Montecristo Epic Craft Cured more and more as it progressed. The burn was nearly perfect throughout, the cigar produced great amounts of smoke and the complexity of the sweet, savory, and spicy notes was excellent. My only criticism is that about a third of the smoking experience felt off balance, with the leather, cedar, bitter chocolate, and white pepper at war with the creamy, sweet, and oaty notes. At roughly $15, this cigar is not cheap, but it is worth the purchase, especially for Montecristo fans and fans of the generally underrated rosado leaf. As for me, I think I’ll be sticking with the Espada for now. From what I read, the main point of Craft Cured was the unusual fermentation process.